Don’t chase the action camera maker’s post-earnings rally. GoPro (NASDAQ:GPRO) still trades about 60% below its June 2014 IPO price of $24, but the action-camera company's stock has actually enjoyed a rebound in August after reporting second-quarter results that crushed analyst estimates. Revenue rose 34% year over year to $269.5 million, exceeding expectations by $27 million. Its non-GAAP loss narrowed from $0.52 to $0.09 per share, topping estimates by $0.16. For the third quarter, GoPro expects its revenue to rise 25% year over year at the midpoint of its guidance range, and for its non-GAAP loss to narrow from $0.60 per share to $0.06 per share. Wall Street expects GoPro revenue to rise 12% this year, finishing the year with a slim non-GAAP loss of $0.05 per share -- compared to a loss of $1.44 in 2016. These figures indicate that GoPro's business may finally be stabilizing, following several rounds of layoffs, the elimination of its entertainment unit, and the discontinuation of several lower-end cameras. However, I've expressed my disdain for GoPro before, and I remain bearish on its long-term prospects for three simple reasons. At first glance, GoPro's double-digit sales growth figures look solid. However, its year-over-year comparisons are very easy -- prior to its three recent quarters of double-digit sales growth, GoPro revenue had plunged by 30% to 50% for four straight quarters. As we can see in the following chart, GoPro's quarterly revenue (which is highly dependent on the holiday quarter) is still trending downward from its 2014 peak. Much of GoPro's bottom-line improvement has also been propelled by cutting hundreds of jobs, rather than by improving the gross margins of its cameras, which are competing in an increasingly commoditized market. That's why GoPro's operating expenses fell 35% annually last quarter, but its non-GAAP gross margin dropped 620 basis points to 36.2%. Therefore, if GoPro's gross margin shrinks faster than it can reduce operating costs -- a real possibility given the level of competition in its niche -- its bottom line will remain deep in the red. GoPro looks like its on the brink of profitability by non-GAAP metrics (which exclude stock-based compensation, acquisition expenses, and other charges). 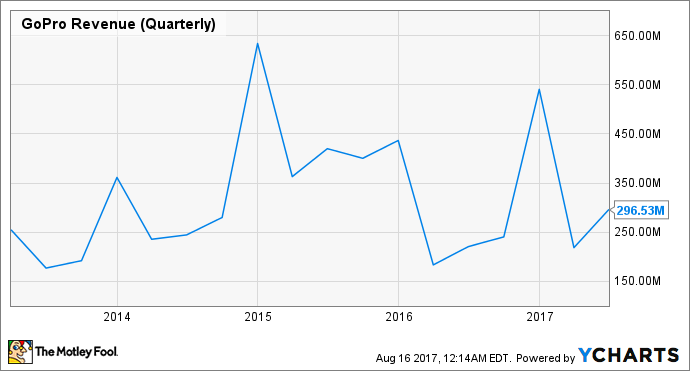 But by GAAP metrics, it reported a loss of $0.22 per share last quarter -- compared to a loss of $0.66 per share in the year-ago quarter. 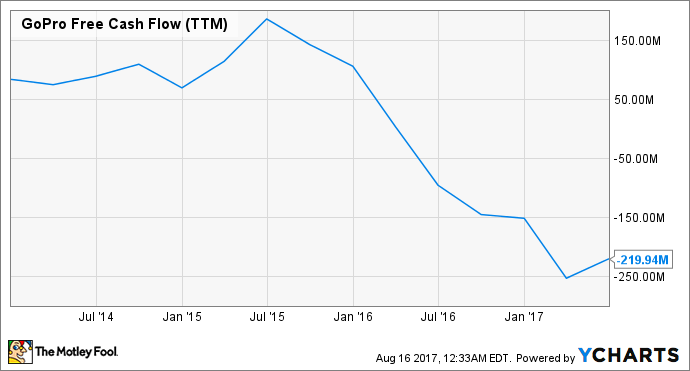 GoPro's free cash flow has also remained negative over the past year. This greatly limits its ability to invest in new products or expand via acquisitions. GoPro's turnaround plan is based on using the Fusion 360-degree camera, its flagship Hero 6, and the Karma drone to fuel top line growth. But each of these products already faces stiff competition. The company is only testing the Fusion in a pilot program, but Garmin has already launched the VIRB 360 -- a waterproof 360-degree camera which offers many of Fusion's features. Samsung, the Xiaomi-backed Yi Technology, Kodak, and Ricoh all sell similar devices, some of which cost less than GoPro's regular cameras. Garmin's VIRB 360. Source: Garmin. GoPro hasn't said much about the Hero 6, but it's unclear what new "killer" features can be added to the flagship line of devices -- which have already recorded 4K video since the Hero 4 Black. Moreover, customers in the market for an action camera have many compelling options to choose from -- including Garmin's VIRB Ultra cameras, Yi Technology's 4K Action Cameras, and TomTom's Bandit. The same goes for the Karma drone, which GoPro claims is the second best-selling drone in America (based on NPD's retail figures). However, GoPro still remains well behind DJI Innovations, which leads the pack with its flagship Phantom drones and smaller Mavic Pro and Spark models. I bought GoPro when it was trading in the $20s, and I caught a falling knife. I eventually sold the stock at a loss last January after realizing that its dysfunctional management, lack of innovative new products, and non-existent moat made it a broken investment. GoPro has taken some steps in the right direction, notably in expanding its software ecosystem and trimming the fat -- but many old problems still remain. It remains a step behind its rivals in terms of innovation, has offered no meaningful ways to stem its declining profitability, and is highly vulnerable to cheaper competitors and improved smartphone cameras. So while GoPro looks better than it did earlier this year, I don't think it's a worthy investment yet.